Golfer's Elbow - What is it? What causes it? How do we treat it? Golfer’s elbow (Medial Epicondylitis) is very similar to, the more well known, tennis elbow. In fact it is the same injury only on the inside tendon of the forearm instead of the outside. What does this mean? It means that we will feel pain where the tendon (medial epicondyle) attaches to the inside of the elbow – that bumpy part that tingles when we knock it. 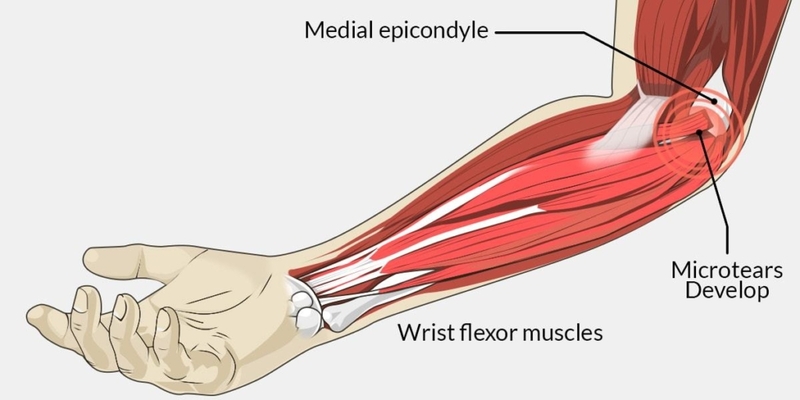 The main symptoms of golfer’s elbow are pain and tenderness around the bony bit on the inside of the elbow called the medial epicondyle, particularly when gripping hard with the hand. It is also not unusual to experience a general weakness in our wrists, with pain occurring when bending our wrist palm downwards against any resistance. Golfer’s elbow is more of a gradual injury that is brought on over a period of time, generally caused due to stress on the tendon from repetitive actions, such as, those used in golf and tennis. Our tendons get aggravated by the resistance of wrist flexion, whereas a tennis elbow injury is aggravated by the resistance of wrist extension. The muscle groups that are affected by golfer’s elbow are the same muscles we use for gripping, so this is a good indication for spotting the condition if we find ourselves struggling to grip items. It is also important to remember that golfer’s elbow isn’t isolated to only those that play golf, this is just a name given to the issue that is commonly found in golfers. As the onset of the injury is often gradual, symptoms can persist for weeks or months before it can become an issue, so it is advised that we seek professional advice as soon as we notice any signs. Protection – protect the forearm / elbow / wrist from being aggravated further. Optimal Loading – this means that rather than resting the elbow and waiting, recovery can be sped up by using the muscles affected at a restricted level to help stimulate the cells in the recovery process. This always prevents the muscles from weakening and shortening. Ice – Use ice immediately after the injury occurs to prevent inflammation. Compression – the use of a support or taping will help compress the affected area, immobilising and protecting it also. Elevation – elevate the hand /arm immediately to reduce pain and blood flow to the injured area. Should your injury worsen over time or continue to cause you issues, Physiotherapy is encouraged. Physiotherapy aids the process of recovery through exercises that help extend the range of motion to the original state, helping you to rebuild the muscles and tendons safely and stronger than before. You will also be educated during your sessions so that we can reduce the chances of a similar injury reoccurring. Other treatments such as ultrasound, soft tissue release, deep frictions and acupuncture may also be used to help golfer’s elbow – your therapists will be able to determine which treatment is best for you in order to give you the most successful chance of a full recovery. If you think that you might be struggling with golfer’s elbow or a similar issue, you can use our FREE Ask A Physio service online at www.physiofusion.co.uk. Alternatively, you may call us on 01282 453 110 to book an appointment to see one of our therapists.